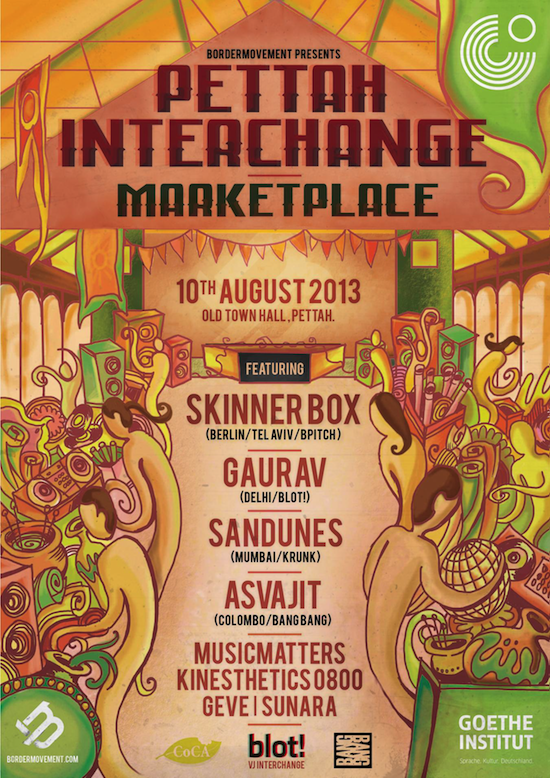 As the iconic venue of last year’s legendary Pettah Interchange is now being restored, Bordermovement and the Goethe Institut have gone deeper into the heart of Pettah to find a charismatic space for another musical adventure: The old town hall market, the historic place from which Colombo started to expand. The electronic duo Olaf Hilgenfeld (Germany) & Iftah Gabbai (Israel) met on a private party in Berlin back in 2003. The result: an intense electro-acoustic jam-session series in which they would utilize any accessible sound source. Through the years they gained a lot of experience while touring in Germanys and Europes finest clubs and established their own unique style – improvised live electronic dance music – following no rule or pattern and retaining a safe distance from every trend. Skinnerbox are an experience, taking the audience on expedition full of soul, breaking house, hard-edged techno-jazz and ambient electronica futurism. The Mumbai based artist Sandunes (Sanaya Ardeshir) blends live music backgrounds with quality dark-studio-production hours and a heavy dose of UK underground electronica. Sandunes’ tunes bounce between 2 step, future garage, post dub step and experimental electronica. From an innovative live set that includes a range of controllers and instruments, to an old school meets nu school garage DJ set, with new tools and toys, Sandunes makes studio meet stage. Sandunes also recently performed alongside Asvajit at Kater Holzig in Berlin and at the legendary Fusion Festival in Laerz. Also returning to Pettah Interchange Marketplace after his positive reception last year in the dungeons of the Gaffoor building is Gaurav Malaker, the musical department of BLOT!.